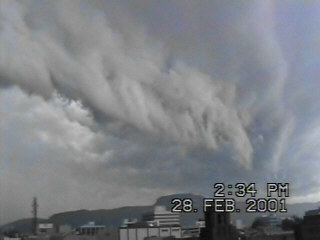 28th February 2001 - Severe squall line Illawarra and Sydney. Today had been shaping as a good chase day, and NSW members of the Australian weather mailing list were predicting big things, at some stages various models had LI's around -8, and TT's close to 60. I was not taking any chances and took my video camera to work. The previous day ( 27th ) had seen a squall line develop around mid afternoon in the Riverina district of the state and give flash flooding and wind damage to the city of Wagga. This squall line persisted for a number of hours and affected Goulburn late in the evening. 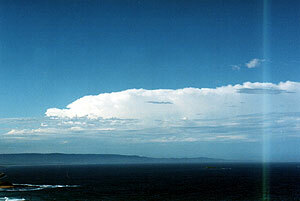 The remnants of the squall even staggered into the Illawarra at around 8pm with weak anvil crawlers and light rain. 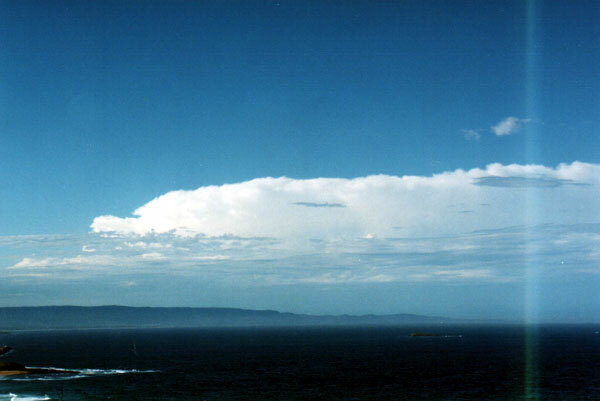 Overnight some weak storms developed just offshore of the southern Illawarra. The morning of the 28th revealed a cover of middle layer cloud, but to the west was lovely blue sky. Close to midday the first signs of significant activity was occurring near Goulburn with a rapidly developing line of storms. A severe thunderstorm warning was issued. Over the next 90 mins this line grew into a fully fledged squall line and by now the Illawarra was under a severe thunderstorm warning. 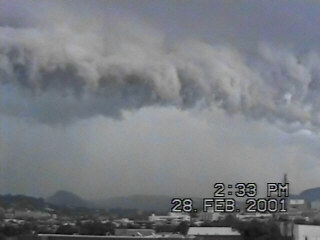 At around 2.30pm the squall line came through the Illawarra. Winds did not get as strong as expected in the Wollongong CBD, perhaps 40 knots. However it was evident that a few kilometres further south around Port Kembla the winds were stronger. Great volumes of coal dust were being lifted and dumped into the Pacific as the gust front moved through the Port Kembla coal loader area. The photo to the left shows this, that dirty area just leff of the building is actually a beach and ocean. Enlarge to fully appreciate. You will also note just how low the gust front was. 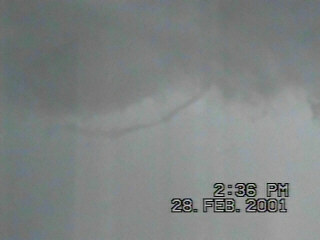 As the gust front moved overhead a small rope like gustnado was observed. After work I ventured to the Port Kembla area and noted some tree branches down. The squall quickly passed the Wollongong area. Just north of Wollongong the squall line actually slowed, the gust front that affected Wollongong had outrun the parent squall line , possibly the Illawarra escarpment played a key role here. However the outflow boundary had created a massive rain free base just to the north of Wollongong. Over the 30 mins the system once again strengthened and moved NE towards Sydney. Above: 1. A small gustnado spins up on the back opf the gust front. 2. The squall line retreats to the north east. Other reports of the squall line can be read at these great sites. 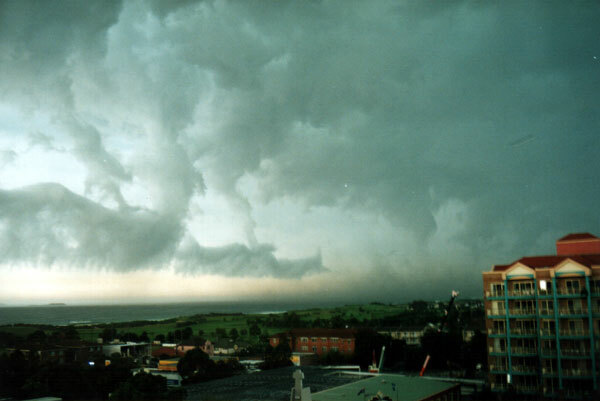 David Croans's report of the Squall line in northern Sydney. Matt Smith of Sydney Storm Chasers report. The Lift Index figures are understated.